Happy Halloween! With flying witches, soaring eagles and magic conjurers, Dark of the Moon is in season! The play's dramatic, supernatural love story was inspired by the centuries-old folk song, the "Ballad of Barbara Allen". Read on to learn more about the history of the play and this ever-changing folk tale. Given a couple of bars of music, most of us could probably hum the rest of the tune to the "Ballad of Barbara Allen". Often heard sung with a Scottish lilt, the traditional folk ballad plays an important role in the Phoenix Theatre's production of Dark of the Moon. The origin of the "Ballad of Barbara Allen" is unknown but it is thought to have come from England, Ireland or Scotland. It is first mentioned as early as 1666 as the "little Scotch song of 'Barbary Allen'". Passed down in an oral tradition for centuries, it wasn't printed until 1780 in England and 1836 in the United States. Probably because of this oral tradition, there are at least 92 versions of the ballad, sometimes known as "Barbara Ellen," "Barbara Allan," "Barb'ry Allen" and even "Barbriallen." While the title character has always stayed the same, the details of the location, the name of Barbara's male protagonist and the tragic love story between them, vary greatly over the years. The setting has changed from London to Dublin, to a fictitious "Scarlet Town," taking place "in the merry month of May" or sometimes the fall. Her young man is usually called Sweet William, Willie Grove, sweet Willie Graeme, or in other versions Sir John Graeme. Most versions of the story tell the tale of a young man who is dying of unrequited love for Barbara Allen. When she is called to his deathbed she is cold and standoffish, but after he dies, she is stricken with grief and soon after dies. In their variation, the playwrights of Dark of the Moon, Howard Richardson and William Berney, used the "Ballad of Barbara Allen" as inspiration for its story of John, a witch boy, who endeavours to become human after falling in love with the copper-haired Barbara Allen. They position the action in a small Baptist town in the Smoky Mountains in the American deep South. Written during WWII in 1942, Dark of the Moon opened on Broadway in 1945. It quickly became one of the most widely performed plays of its generation, directed by Peter Brook and the role of John performed by actors such as Paul Newman and James Earl Jones. Although not a musical, there are assorted songs that are performed in the play, and yes, an adaptation of the song is one of them! It is integrated into the text of the play and sung — and commented on — by Barbara herself: "But that's a sad song. I allus like the gay ones best." The traditional folk music for the ballad is reasonably consistent across history's many adaptations. In the 20th century the ballad has been recorded by the likes of Joan Baez, Doris Day, Johnny Cash, The Everly Brothers, John Travolta, Emmylou Harris, Pete Seeger, Bob Dylan, Simon & Garfunkel, Burl Ives and The Grateful Dead! Click here to listen to a medley of famous versions. Interestingly, there are lots of pop culture references to the ballad around the time that Dark of the Moon became a hit on Broadway, including the 1951 film classic Scrooge, starring Alastair Sim; the 1958 Yul Brynner film, The Buccaneer; and being sung by Porky Pig in a 1958 Warner Bros. cartoon! 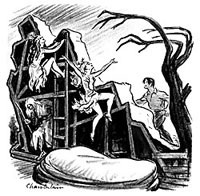 In the Phoenix Theatre's production of Dark of the Moon, Music Director and Sound Designer John Mills-Cockell integrates the ballad's musical themes into many aspects of the play's rich auditory tapestry, from lilting background sound effects to haunting witches' calls — creating even more variations on the 400 year old ballad. October 29: Box Office Open for Dark of the Moon tickets. Join Dr. Michael Nowlin of the UVic English Department for his talk entitled "Dark of the Moon: An Allegorical Folk Play about What?" Dr. Nowlin is a specialist in 20th-century American Literature. This free lecture is open to everyone, including those with play tickets for alternate evenings. On a budget? Join us for Preview nights — the Tuesday and Wednesday before our show opens — for only $6! Tickets are ONLY available in person at the box office on the day of the show beginning at 5pm. November 21: Call for Submissions for 2009/10 "Spotlight on Alumni"
Recent Department of Theatre graduates Victor Dolhai (BFA'07), Trevor Hinton (BFA '07) and Kholby Wardell (BFA '08) are in the Belfry Theatre's production of Brilliant! The Blinding Enlightenment of Nikola Tesla. Chelsea Haberlin (BFA '07) is directing 14 inmates at the William Head Institution in George Orwell's famous satirical novel, Animal Farm for William Head On Stage, running October 31 to November 29, 2008. Theatre alumna and playwright Janet Munsil (BFA '89) has a new play debuting at Touchstone Theatre in Vancouver. Influence about the British 19th century poet John Keats runs November 6-15, 2008. Intrepid Theatre is hosting a fundraiser-reading of Influence in Victoria on November 27 at 8pm. The three Stubel sisters, Treena(BFA '95), Camille (BFA '94)and Celine(BFA '02) Stubel — all theatre alumnae — performed together as three sisters in Theatre SKAM's production Chekov's The Three Sisters at Intrepid Theatre in October. For those that missed last week's Public Issues Community Forum on Censorship and the Arts, it was recorded and is now available as a podcast on the Continuing Studies website. It was a fascinating discussion moderated by Dr. Allana Lindgren (Dept. of Theatre) with a panel of guests: Professor David Leach (Dept. of Writing), Dr. Allan Antliff (Dept. of History in Art), Mr. Alain Pineau (Canadian Conference of the Arts). To download the podcast or read more about the panelists click here. You can still subscribe to the remainder of our season for only $33 for 3 shows. At $11 per show — a 50% savings off the individual ticket price — it's the best deal in town. Plus our subscription offers lots of benefits and flexible options to work around your busy life. To order, download our subscription order form and fax it to us or call 250.721.8000. Just a reminder about our Deluxe Membership Package of extra benefits designed to enrich your experience at the Phoenix Theatre. Only $20, in addition to a basic subscription, gets you 4 easy-to-use parking passes, 4 free concession beverages, theatre tours, UVic Bookstore discount, and more to help you enjoy your visit to the University of Victoria. For details or to order call 250.721.8000.